Klompen, träskor, or geta; they are all clogs from Netherlands, Sweden and Japan respectively; and all made of wood, I suppose; just like Chinese clogs. Chinese clogs, traditional ones I mean, are unlike the ones sold in Alibaba; the latter look more plastic and resemble more of the klompen or träskor. Where I'm living, traditional Chinese clogs are still in use, mainly as footwear to the bathroom and toilet. Rarely would you see a person in town wearing them when one can opt for the more fashionable Nike or Adidas. I remember in the 70s, the more dainty red clogs, some painted with delicate flowers, form part of the dowries of bride to be. 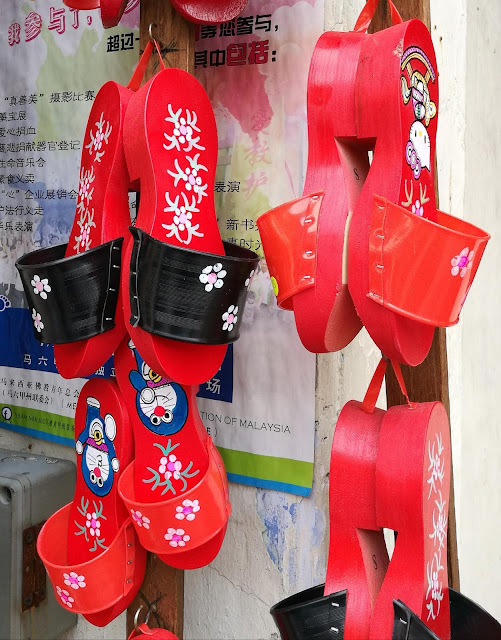 Not so sure if this is still in practice but in Melaka, red clogs are still on sale. Some have the pictures of Kitty Cat and Doraemon, popular Japanese cartoon characters painted on them and I suppose they are more for the tourists to the historical city. Chinese clogs are here to stay! I chanced upon an article which states that Chinese acrobatics are rarely seen outside China. 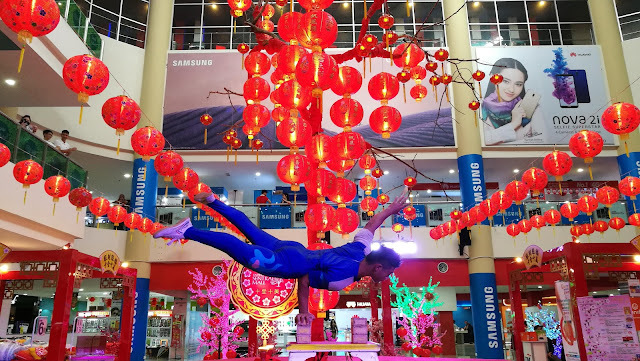 Maybe true, maybe not but for the past few years, Chinese acrobats from Mainland China have come to Taiping, my little hometown to perform especially in shopping malls during Chinese New Year. It is not the usual big acrobatic troupes that travel internationally and make a splash in the newspaper. This is a little troupe consisting of about five acrobats who will perform juggling acts, balancing acts and gymnastics, circus style just like their western counterpart. Chinese acrobatics reportedly consist of two styles, circus style and martial arts style. In the latter, martial artists will fight out a scene with weapons. Not sure if western acrobatics offer the latter. 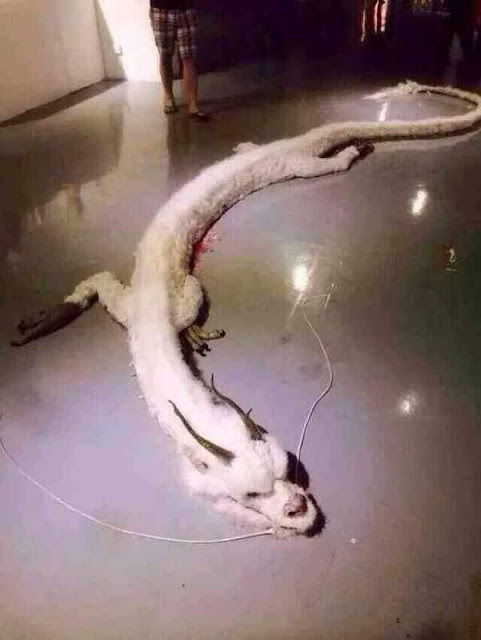 Take this story which I received through whatApp with a pinch of salt : A white dragon with rabbit-like fur was killed in Gerik, Malaysia by a Chinese man while it was stealing his - what else -rabbits! Never mind if people here rather raise cows than rabbits or if the photo of the dragon looks like being taken straight out of a Hong Kong movie. A dinosaur, at least has its fossils in the museum but a dragon and an albino one at that ; if there is one around, a Chinese probably, will not kill it; the dragon being a revered creature and then of course, how could you render something so rare extinct? Anyway, whoever started this story made me wonder: Do dragons eat rabbits? What exactly do they eat? Are they carnivores, herbivores or omnivores?